NAEM's 2015 EHS Management Forum Raj Chaudhry, Program Manager Sustainability & Management Systems; BD & Co.
Raj Chaudhry, Program Manager Sustainability & Management Systems, BD & Co.
Raj Chaudhry is the Program Manager for Sustainability and Management Systems at BD and Company. He was previously with CareFusion Corp. as Global Manager, EHS for 5 years and transferred to BD when CareFusion merged with CareFusion in early 2015. Raj's primary role at BD is to standardize the implementation of management systems at the company globally and support the development, implementation, and strategization of programs to strengthen the culture of sustainability throughout BD. 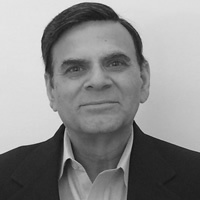 Prior to joining BD/CareFusion, Raj spent almost 25 years with Philips Lighting Electronics and was the Sr. Director of EHS and Product Quality when he left them. At Philips, Raj was extensively involved in strategizing and driving the EHS programs and also established management systems (ISO-14001, ISO-9001) to support business expectations. At CareFusion, Raj was able to establish an Umbrella ISO-14001 Certified program for 15 sites together through standardized procedures, harmonized implementation approach and cohesive teamwork. Raj is also very involved in establishing and reviewing OHSAS 18001 (safety management system) program and has good expertise and knowledge in setting up this system in harmonization with ISO-14001 or by itself. He has been effective in deriving business value from the establishment of management systems through improvements, standardization of programs and approaches, regulatory compliance, and people engagement. Raj holds an M.S. degree in Chemical Engineering from the University of Kansas and an MBA from Texas A & M University. Raj and his wife live in San Diego, California.